Hip fractures occur in the fall, and the impact in the area of greater trochanter (most often in the elderly). They are divided into the medial (endoprothesis) and lateral (cartilage), impacted and biased. Consolidation of medial fracture occurs much slower than the lateral as for medial fracture of the damaged vessels that feed the head of the femur, the result is (in some cases) necrosis of the head, and the vessels of the round ligament in old age sclerotic (fibrous). To restore the blood supply is necessary not only convergence bone fragments, but their complete contact that is impacted fracture. Therefore, physiotherapy sessions is very important to prevent rasklinivanie fracture. Patient is laid on the bed with wooden shield, leg - the tyre of Bellera, impose skeletal traction tuberosity of the tibia with cargo 3 kg (Fig. 26). 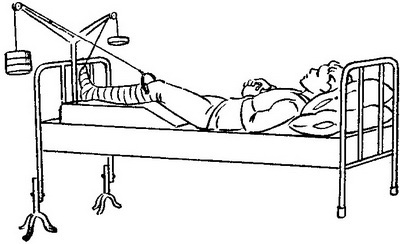 The tasks of medical gymnastics impacted hip fractures in the first period are: the removal of the patient from the anxiety associated with the trauma; restoration of blood and lymph circulation in the damaged leg, resorption of hematomas; struggle with atrophy of the muscles and restore muscle tone, improve the work of all organs and body systems. On the background of respiratory and General developmental exercises the following exercises damaged leg in traction: the stretching and bending of the fingers, back and plantar flexion of the foot, the movement of the patella, the lifting of the basin, building on foot bent at the knee and hip joints healthy feet, and hands. In some cases 10-14 days skeletal traction is replaced with plaster bandage with fixation of the pelvis (Fig. 27). In a cast patient teach yourself to turn over, to sit on the buttocks uninjured side down in plaster foot, walking on crutches, walking or not stepping on his foot, to exercise his fingers, the movement of the patella, send pulses to movements in the ankle and knee joints, to strain the quadriceps muscle under the plaster. Each exercise is repeated 6-10 times, and the whole complex of exercises 3-4 times a day. The period of immobilization for 1,5-3 months, before the formation of callus, which is confirmed by x-ray. The second period starts with the removal of plaster bandages and continues until the patient will learn to walk without the crutches and a stick. The tasks of medical gymnastics in the II period are teaching walk support of the restoration of mobility of joints and strengthening muscles of the limbs, the development of resistance, coordination, balance, training walking on stairs. Exercises are performed in different initial positions: lying on his back on the healthy side, standing based on crutches and without them at the gymnasium wall, sitting, walking. Each exercise is repeated 6-8 times, the whole complex is 3-4 times a day. The duration of the II period of 1-2 months. III the period of training. The objectives of therapeutic exercises are: final restore the function of damaged limbs, practice walking without support, including the stairs. Due to the fact that the medial hip fracture is usually in elderly and senile age, running, jumping, and other stress exercise activities are not included.